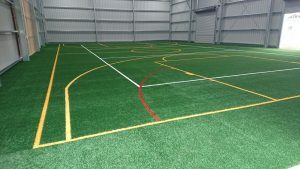 Each synthetic grass turf volleyball court boasts individually tailored line markings that have been scaled to size to suit the unique dimensions of the playing surface. For the sake of maintaining the highest levels of precision, all line markings are cut in with our Laser Cutter. They are never painted on, as they will likely rub off with time and use. 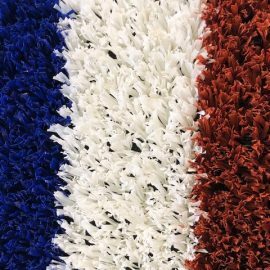 Artificial turf for your volleyball court is available in green, rust and blue, while line markings come in red, blue, yellow and white. Grass Solutions can also design artificial grass courts with integrated line markings for a wide variety of other sports, including netball, basketball and bat tennis. Challenge Pro PE –A 19mm artificial grass that is one step above the rest, with the added attribute of double backing and a high stitch rate. This makes it ideally suited for busy tennis court clubs, schools and commercial centres. You can also ask us about the supply and installation of artificial turf volleyball court accessories such as volley ball poles and netting.